'Efficiency'- get more done with less! Someone asked me, "What is ONE WORD that I would describe my general goal of improving one’s movement with?" After an intense bout of mental gymnastics I said; ‘EFFICIENCY’. Many people would choose ‘strength’ or ‘flexibility’ or ‘stability’. ‘Efficiency’ however, is not exactly the trendiest term or a word that you could find on the cover of the fitness magazine attracting attention. So, who cares about efficiency anyway? Well I do! And maybe you will catch some of that enthusiasm too if I can make my case well enough. "The ability to do something or produce something without wasting materials, time, or energy." Merriam-Websters. This picture illustrates what kind of layers could be found around the ‘efficiency’ of movement. Well if your goal is ‘movement’, which is an action towards a specific goal, you could start by assessing the quality of your movement solution to a given situation. Then you could choose tools or strategies with which to improve the quality of your movement solution. The strategies might very well consist of strength training or cardiovascular development, but they might also be more related to the quality instead of just capacity of movement, such as ‘removing obstacles from the path of movement to save energy’ or ‘increasing the accuracy of sequencing within the movement’. You just won't know until you evaluate and learn to know the individual in front of you. If your goal is an action or movement within the world of sports, the efficiency of your motions getting that specific task done is of an outmost importance. Efficiency in performance means goal-driven precision with effective and strategic use of the energy available. So next time you work out, don’t think how many calories can I burn during the workout, but how much energy can I save and still get to my goal safely and effectively. That’s efficiency! Have a victorious New Year! Life is a journey, and so is discovering better movement. It is a journey of striving forward towards a goal or goals. On our path we will encounter a few obstacles and hopefully a lot of successes. I have certainly had a journey with some of each. Even the challenges and the struggles have had a landmark of great importance as part of the process. As a movement coach I want to guide my athletes towards their optimal capacity in sports, and in life as well. This requires constant study and reconnaissance of the terrain in between the start and the destination. The terrain is never the same and I need to have solid principles in my backpack, skills and experience to navigate through the changing environment. I carry my compass to keep me directed, my map to determine my current location and my knowledge of human function as my eyes in observing the movement. I rely only on equipment I know how to use and I also want to travel light. This allows me as a guide to be free and more precise and efficient in my task of taking my athlete to their desired destination. Where are you in your journey of movement? What is keeping you from destination? Got lost in the 'Valley of Nagging Pain' or stuck in the 'Marsh of the Forgotten Fun'? Enjoy the journey my friend! Running with purpose and power in every step, part 1. 368-Concept can help develop training and conditioning strategies that are effective and enrichening for the movement of running. In this first part we take a look at the "chains" within the runner's body. 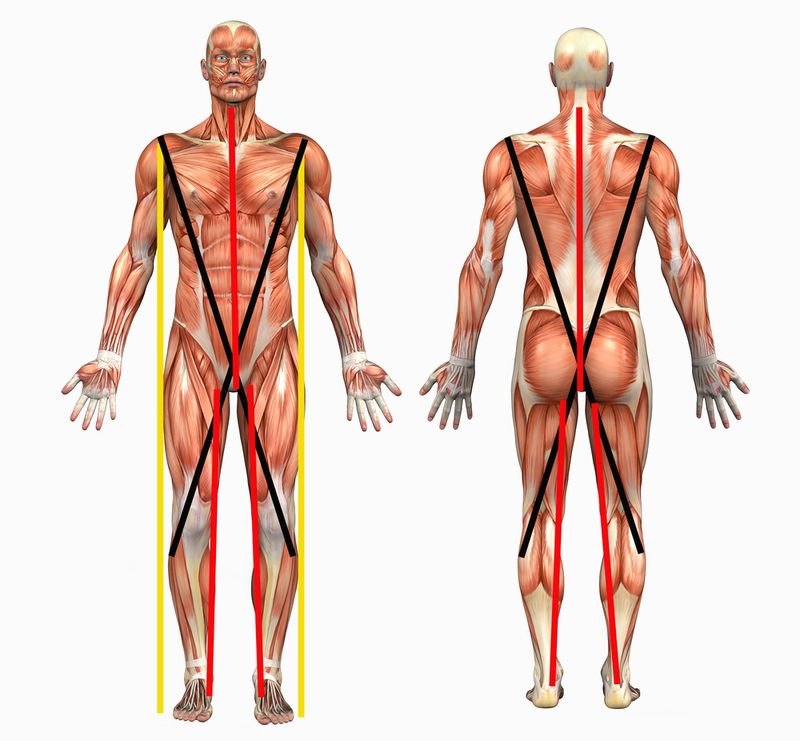 These kinetic chains describe how the different parts of the body work together in real life and sports and also how they are connected via muscles and fascia. 8 chains according to 368 conceptLet's examine the diagonal chains (marked black) as part of the running movement. First observe the excellent running mechanics demonstrated by Carl Lewis. We can draw a line from his left knee across his abdominal wall to his right arm. That diagonal front chain is now stretched out, loading elastic energy and ready to explode. The other side (right knee to left shoulder) is shorthened in order to create the opposite action. The same occurs with the diagonal back chains. The diagonal chain system, a.k.a. the Double-X, is essentially important for the power and force production in running. Instead of only strengthening individual muscles it is crucial to integrate the whole kinetic team and work to improve the "stretch-shortening cycle" of the whole chain of muscles and fascial components. These diagonal chains have a huge role in creating the powerful rotational action in running. In 368 -Training Systems diagonal chains are being challenged particularly by utilizing horizonal resistance exercises. The horizontal resistance applied from different directions/angles with different speeds allows the diagonal chains to be activated and strengthened in a way that is beneficial for a runner. Here are some of our basic exercise variations (1-arm press, 1-arm row, 2-arm rotation) performed in a split stance. These exercise variations emphasize the team work of all the body parts connected into one kinetic chain. Run with purpose in every step! I am a big fan of integrated abdominal training. I believe most of the "core training" should be done in a standing position with a combination of vertical and horizontal forms of resistance. Think of the stages of early child development: from the back to the belly to more upright into eventually standing. This will help the abdominal wall and the "pillar" of core to become and effective and participating member of the total movement system. We don't do this progression with everyone, but for some who have trouble initiating the core control activity. Here is another potential stage of the progression: Kneeling with horizontal resistance. This phase already requires a great team-work capacity between the hip (glutes/hip flexors) and the adbominal wall. As you already know so well, this exercise is for demonstrational purposes only.